The legendary one-shot that spread its name in all directions begins its new series!! A loser samurai named Isobee, who lives in any way a dawdling, slacking life, takes action (sort of) in the city of Edo. 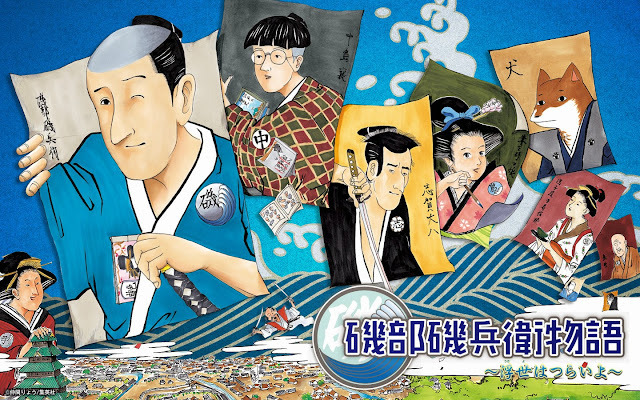 Weekly Shonen Jump's gone mad with a new style Ukiyoe Gag Manga!! Isobe Isobee Monogatari (The story of Isobe Isobee) by Ryou Nakama started in issue 47 of Weekly Shonen Jump. Nakama published three oneshots earlier this year which caused quite a stir in Japan, so much so that it was serialised the same year (which is extremely rare). The series follows the daily life of Isobe, a lazy samurai living in Edo. It is a gag manga with what can only be described as "unique" artwork. Weekly Shonen Jump is really backing this series, but will it fail like Sensei no Bulge or will the Japanese readers love this series as much as they liked its oneshots.